Hail Hail! 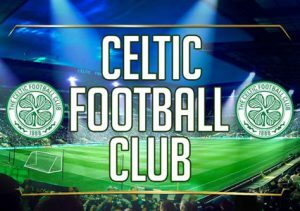 Celtic Football Club is a 5 reel, 20 payline video slot from Blueprint Gaming that celebrates the Glasgow footballing giants. This virtual trip to Parkhead comes with random wilds that can fill up to 4 reels as well as bonus rounds that awards instant wins, free spins, pick me prizes and a cash trail. Play on all devices from between 20p and £200 per spin. The design here is pretty good. With the packed stands of Celtic Park in the background, you’ll see lower value royal symbols as well home and away shirts and the Celtic badge. The best of the standard symbols is the gold star representing the club’s 1967 European Cup triumph. Land 3, 4 or 5 of these on a payline for a payout of 2.5, 10 or 25 times your bet. There’s also a wild which offers awards of 0.1, 5, 50 or 1,000 times your bet. On any spin, you could be awarded the Wild Reels feature. This randomly turns up to 4 reels totally wild. Champions Free Spins Bonus feature – on offer here are 5 free spins. Look out for the coin which is a mystery symbol. All the coins on display turn into the same matching symbol. Landing 3 scatters adds another 5 free spins to your tally. Celtic Way Bonus feature – this is a variation on the cash trail. Work your way along the board collecting prizes as you go. Trophy Room Bonus feature – this is a take it or leave it pick me round. Choose trophies to reveal cash prizes. If you like your prize, you can collect. If not, you can reject and try again. You’ll have up to 3 rejections here. Mystery Win feature – this is a straight cash award. Celtic Football Club is pretty good as far as football-themed video slots go. The visuals are crisply done and the chanting crowd conjures up a pretty good atmosphere. There’s a decent array of extras on offer here too. This video slot won’t of course be very popular in the blue half of Glasgow. If you’re on the green side of the Old Firm divide, then it’s certainly worth a look though. You can also win 20,000 times your bet if you fill the reels with wilds – however, Blueprint Gaming cap the max win at 10,000 times your bet. If you’re a football fan (or support Rangers), Yggdrasil Gaming’s Bicicleta is very good.